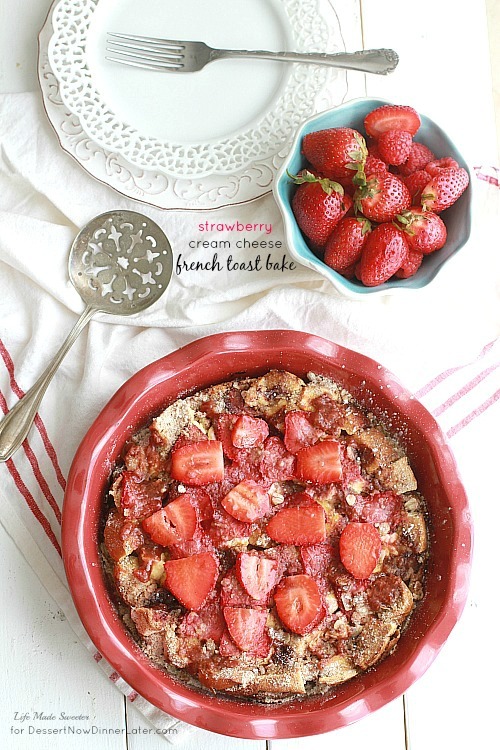 Strawberry Cream Cheese French Toast Bake - Dessert Now, Dinner Later! 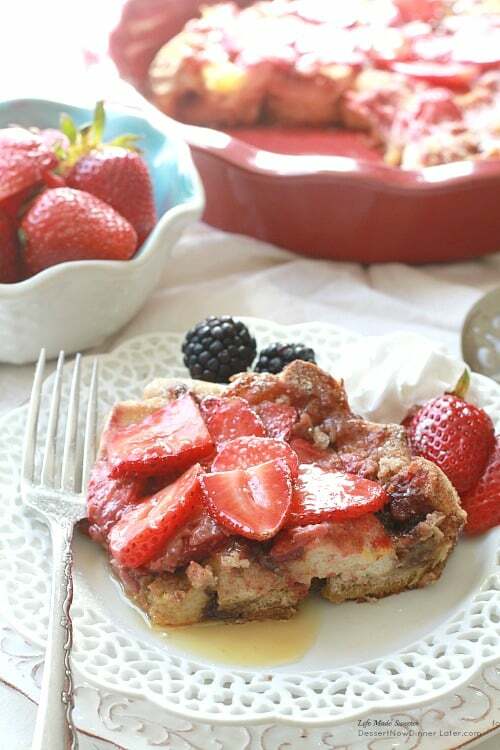 An easy and delicious baked French Toast bursting with strawberries and cream cheese. 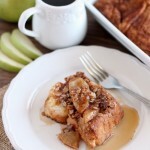 Perfect for breakfast, brunch or even dinner. Hey everyone, it’s Kelly from Life Made Sweeter again! I’m here today to share a sweet breakfast treat that you can whip up just in time for Mother’s Day or any other special weekend. 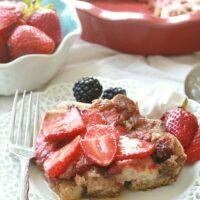 This Overnight Strawberry and Cream Cheese French Toast Bake is so simple and couldn’t be easier to make. All you have to do is gather up the ingredients the night before, park the dish in the fridge, and when you wake up the next morning, pop the dish into the oven and bake away! I made this in a pretty red 9-inch pie pan but you can totally use a 9×9-inch square pan. 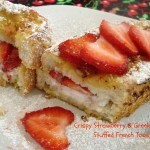 An easy and delicious baked strawberry and cream cheese french toast. Just throw together everything the night before and pop into the oven in the morning. Lightly grease a 9x9-inch square baking dish or 9-inch round pie pan. Arrange half of the bread cubes in the bottom of the pan. 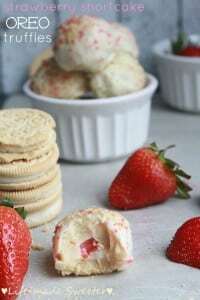 Layer cream cheese cubes and half of the strawberry slices evenly over the bread cubes. In a large bowl or measuring cup, whisk together the eggs, milk, cinnamon, maple syrup, and vanilla. Pour evenly over bread cubes. Press the bread cubes slightly down to absorb the milk/egg mixture. 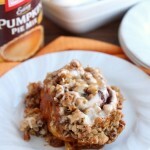 Make the streusel topping: In a medium bowl, combine the flour, brown sugar, and cinnamon together. Cut in the cubed butter with a pastry blender or two forks. Sprinkle the topping over the soaked bread. Top evenly with the other half of the sliced strawberries. Cover pan with foil. Let chill in refrigerator overnight. In the morning, remove french toast from fridge. Preheat oven to 350 degrees Fahrenheit. Bake covered with foil for 30 minutes. Remove the foil and bake for another 25 to 30 minutes or until fluffy and golden. Remove from oven and allow to cool for 5 minutes. Top with syrup and additional toppings if desired. Serve warm. To make this into a 9x13-inch casserole dish, you may have to increase the ingredients by 1.5 times or refer to the amounts used in the original recipe source link below. This looks so yummy, Kelly! I love eating strawberries in breakfast meals. Definitely going to try this! It’s so pretty to. 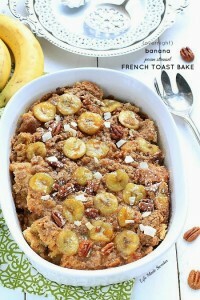 We barely ate this for breakfast this morning and it was wonderful! 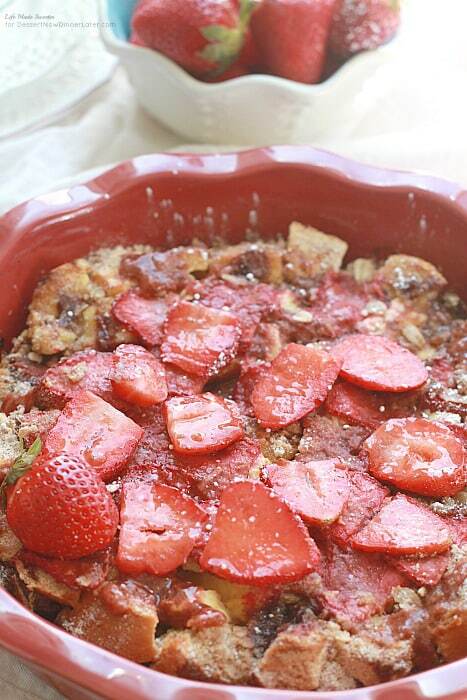 I’ve never made a French toast bake before, but when I saw this post last night I just knew I had to make it for myself for Mother’s Day! 🙂 So last night I prepared it, and this morning my husband got up early and popped it in the oven. It smelled awesome, but then tasting it was even more awesome! I put in more strawberries than it called for, and I cooked it in an 8″ x 11″ pan, but besides that I made the recipe exactly as written. My husband, son, and I all loved it. Thanks for a great recipe! 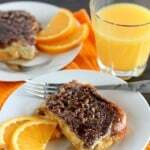 Kelly, this french toast looks incredible! I love overnight breakfasts, they’re the best! I’m a sucker for anything with strawberries!!! love this recipe from Kelly!!! It was delicious! I put in some extra strawberries and less butter in the topping, about 2-3 tablespoons instead of 6 (trying to cut down calories) and it was perfect. Also, next time I will make it in a bigger pan, so the topping will cover bigger area, it was so great!